A truck transports a U.S. army military vehicle on the road near the Polish-Ukrainian border in Krakovets. The Kremlin said Friday that the arrival of about 300 U.S. paratroopers in Ukraine to train Kiev's National Guard could destabilize the situation in the east of the country, where pro-Russian separatists are fighting Ukrainian government forces. Ukraine has repeatedly asked for international help to boost its defensive capabilities. Western countries have so far declined its requests to supply weapons, while offering non-lethal military aid and training. 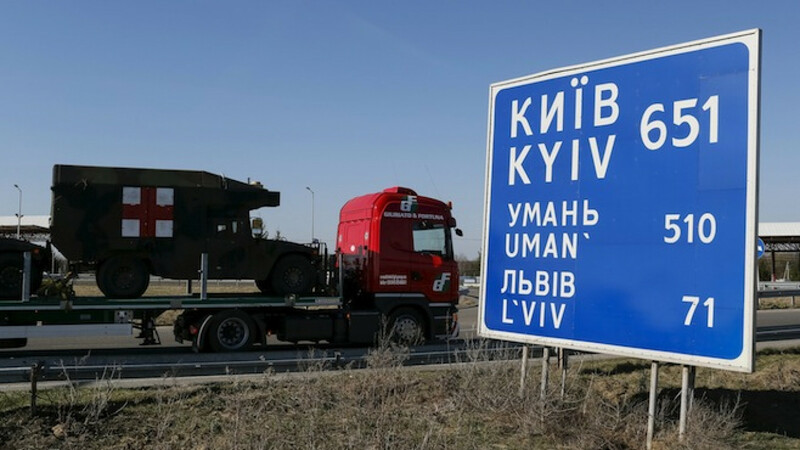 "The participation of instructors or specialists from third countries on Ukrainian territory, where the domestic Ukrainian conflict is unresolved … could destabilize the situation," Kremlin spokesman Dmitry Peskov told reporters in Moscow during a conference call. He was referring to the arrival of the U.S. paratroopers in western Ukraine this week to begin a six-month training rotation with three battalions. Ukraine and the West have accused Russia of interfering in the year-old conflict by sending in troops and weapons. Moscow has denied those charges and warned against excessive Western influence in Ukraine. The training mission, which was first announced in August last year, had been due to start in March but was put on hold until further progress was made in implementing a cease-fire deal, agreed in February, to end a conflict in which more than 6,100 people have been killed. The truce remains technically in force, despite almost daily reports of casualties and cease-fire violations. Britain has already sent military personnel to train Ukrainian troops, while Canada and Poland have pledged to send 200 and 50 instructors respectively this year.